Do you have children who are interested in gardening, helping the environment and learning new skills? My family and I love experimenting in gardening and teaching our son all about nature and the environment. We have tried to start our own herb garden (mostly as a way to save a little extra money) and tried to get our son involved, but it was a slow go. It was tough to get it started and without proper instructions (on how to pot) it really didn’t work out to well and he lost interest very quickly… needless to say my son was bummed out! However, we have found an amazing company that sells gardening kits just for children and teaches them how to grow vegetables and herbs from seed to harvest. Growums sells pre-made gardening kits that include everything you need to start planting your very own vegetables and/or herbs. With 6 available kits the fun is endless! Not only do you receive the wonderful kit, Growums has an on-line tutorial to help your kids every step of the way! "This interactive gardening kit is the first of its kind. Growums combines learning and fun in the real life garden with an exciting, educational online experience thanks to a loveable cast of garden characters. 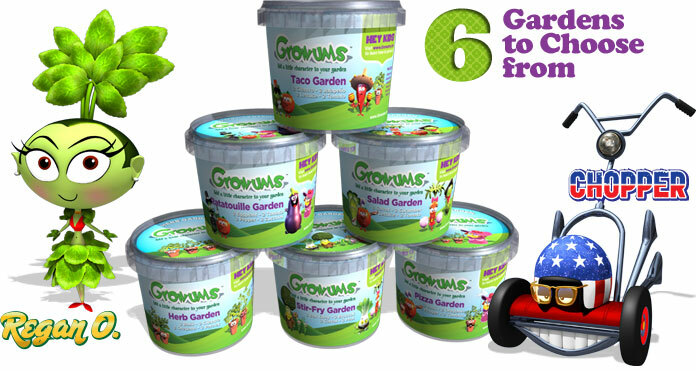 My son loves to play on the computer and I love the fact that Growums has games and interactive tools just for kids." There are 6 amazing kits to choose from: Taco Garden, Ratatouille Garden, Salad Garden, Herb Garden, Stir-Fry Garden and Pizza Garden. There is something to please everyone in the family. Once you receive your Growums Kit be sure to get on-line and register it at Growums.com. At Growums.com 17 fun Growum characters come to life and interact with you in every process of your gardening. 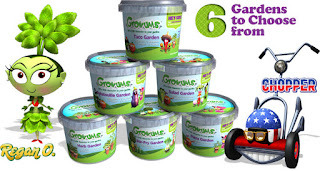 At Growums.com you can check out gardens, track your garden, meet other growums and play games. Once you register you can also view the classroom videos. The kit was easy to use and the interactive website made the process fun and easy. Make sure you contact Growums for your next fundraiser event for your children's school or any organization. These kits would make great gifts, stocking stuffers, aids in education. My sons school is very interested in adding this kits to the curriculum next year (when it starts to get nice again). You can purchase the kits at online on the Growums website. Or you can look up what local stores carry Growums, just enter your zip code in the search box. They also sell Growum shirts and wristbands. Thanks to Growums one lucky Tips for Saving winner will have the chance to win a kit of their choice by using the easy Rafflecopter entry form below. I really like the taco kit! I would love to have the Salad Garden Kit. Would love the salad garden. I would like to try the pizza garden. We always make homemade pizza, and I think my daughters would like to use the items they grew on their pizza. My son would love the salad kit! The salad kit would be great! I'd like to win the pizza kit or the taco kit! I'd choose Salad Garden Kit. I would like the taco or stir fry kit!